Sir John Brown (1816-1896), of John Brown and Co, British industrialist, known as the Father of the South Yorkshire Iron Trade. Educated in the Portobello area of Sheffield at Robert Thompson's School. While there he met Mary Schofield, a daughter of a local auctioneer who was a year older than he was and whom he would later marry. He finished his studies at Mr. Wilkinson's School in Broomhall. Upon leaving school at 14 years old his father wanted him to become a linen draper, Brown however wanted to enter the emerging Sheffield steel industry and accepted an apprenticeship at Earl, Horton and Co earning six shillings a week. 1837 Brown was offered a share in the firm by the senior partner Mr. Earl but was unable to accept it because of lack of finances. Nonetheless he did take over the company's factoring business with the help of a loan for £500 thanks to the backing of his father and uncle and for several years travelled the country selling goods. 1844 He started his own company John Brown and Co, manufacturing steel at a small foundry on a site at what is the now Orchard Square Shopping centre. The business prospered so well that he sold his factoring firm and moved to larger premises on Furnival Street. 1848 Brown invented the conical steel spring buffer for railway carriages which he sold to the London and North Western Railway as well as other railways throughout the UK. 1850 Became a member of the Institution of Mechanical Engineers. 1856 January 1st. Brown opened his new Atlas Works in Brightside in an effort to centralise his workshops and workforce in one place; the works originally were on a three acre site but within three years had grown to 30 acres. 1859 Brown was producing rails for the quickly expanding railway industry using the Bessemer process. 1860 Brown turned his thoughts to the production of armour plate when he saw the French battleship La Gloire while on holiday in Toulon in the south of France. On discovering that the armour on the ship was made by hammering he returned to Sheffield and built a rolling mill and submitted examples of rolled armour plate to the Royal Navy. Tests on the armour at Portsmouth in 1862 were so successful that by 1867 75% of Royal Navy ships had Brown's armour plate on them. The success of his armour business made Brown a personal and professional fortune. 1861 Living at Thirl hall, Eccleshall Bierlow, Sheffield: John Brown (age 44 born Sheffield), Manufacturer of Iron, Steel and Railway Springs, Merchant Alderman, employing 1200 men and 200 boys. With his wife Mary Brown (age 47 born Sheffield). Also a visitor William Cowan (age 37 born Edinburgh), Engineer. Three servants. 1864 Atlas Works were converted into a limited liability company with a capital of £1,000,000. 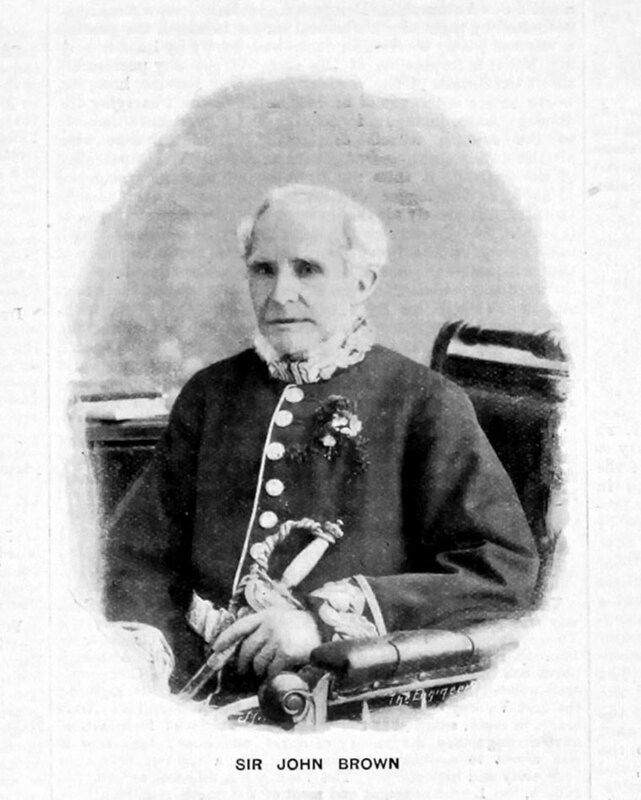 1861 and 1862 Brown was elected Mayor of Sheffield and was Master Cutler in 1865 and 1866. 1865 He had Endcliffe Hall built as his private residence, this was and still is the largest private house ever built in Sheffield. 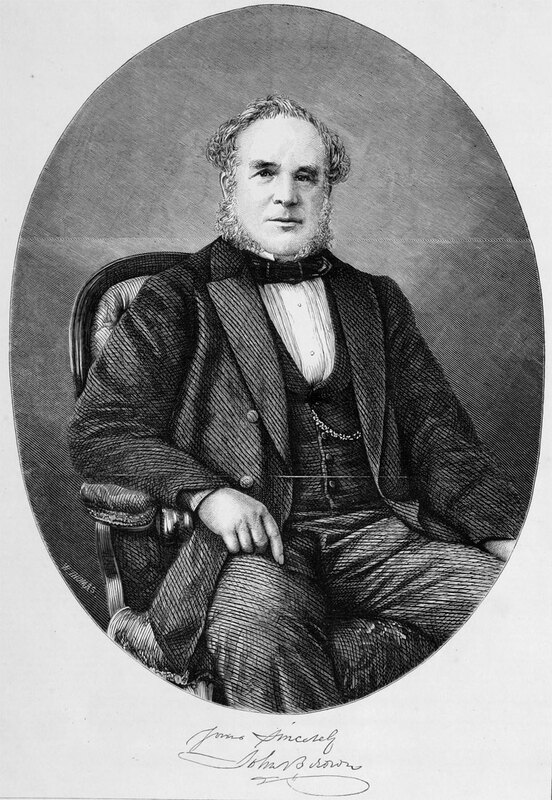 1867 Brown received a knighthood for his services to British Industry. 1881 Living at Endcliffe Hall, Nether Hallam, Sheffield: Sir John Brown, Knt. (age 64 born Sheffield), Magistrate, Retired Steel manufacturer. With his wife Lady Mary Brown (age 67 born Sheffield). Seven servants. 1891 Visitors in the lodging house at Higher Terrace, Tormoham, Devon: Henry B. Wrey (age 28 born Ireland), Civil Engineer; Fanny C. Roche (male) (age 59 born Diddlebury, Shropshire); and John Brown J.P. (age 74 born Sheffield). .
1896 December 27th. Died, of Nervion, Shortlands, Kent. "...In 1892, when he left Sheffield for his winter quarters, he had evidently made up his mind that he was not likely to return, and he subsequently disposed of his furniture and art collections at Endcliffe Hall, in the West End of Sheffield, where his residence was the noblest building in the locality. Soon after the mansion and estate were sold. On several occasions his condition gave rise to the utmost anxiety, and more than once his death has been reported as having taken place. The end came somewhat unexpectedly. Sir John, who had been feeling rather better than usual, left St. Leonards, where he had resided for some time, to spend Christmas with his friends..."
Full of years, and with a record of useful invention and industry, Sir John Brown, the founder of the Atlas Steel Works of Sheffield, and the pioneer of armour-plate manufacture, passed away on Sunday last, December 27, at Bromley, Kent, after several years of indifferent health. He was born 80 years ago in Sheffield, and was early engaged in the staple industry of the town - the manufacture of files and table cutlery. So soon did that resourceful energy which characterised his life discover itself, that his employers invited him to become a partner when he was 21 years of age. He, however, had not the capital, but his father and uncle guaranteed 500l. to the bank, and thus the future knight was started in partnership. For 10 or 11 years the work went quietly forward, and then a new branch was created as an outcome of the railway extensions. Wagons had no buffers, and those on the passenger cars were far from satisfactory, so that when Brown invented the conical steel buffer spring in 1848 a ready market was found, and, for a time, the production was at the rate of 150 sets a week. Of the four countries in the kingdom, England, curiously enough, was the last to adopt these, Wales, Scotland, and Ireland preceding in the order given. The several departments of his works were at this time scattered over the town, and, in 1864, they were concentrated in what has since developed into the Atlas Works, now employing 4000 artisans; but in the interval there has been added steel manufacture, armour-plate rolling, ordnance forging, and all sorts of railway appliance, while the turnover has multiplied more than a thousandfold. ↑ The Engineer 1897/01/01, p005. This page was last edited on 23 June 2017, at 08:12.